Americans are obese. We’re more obese than any other country and we’re getting more obese each year. The most recent results of the 2015 National Health Interview Survey were recent released and they paint a picture of the reality of Americans’ health. In 2015, 30.4% of American adults were obese. For those of you unfamiliar with the definitions, overweight is a body mass index (BMI) between 25-30. Obese is a BMI > 30. 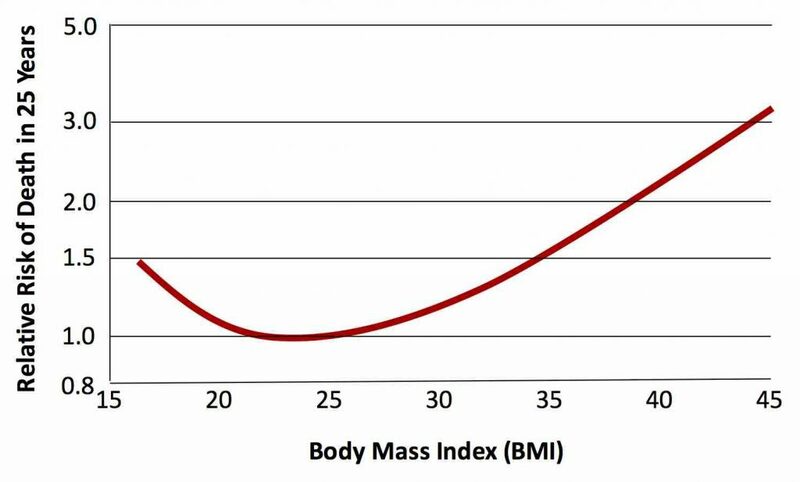 Obesity can be further stratified into different grades: a BMI 30-35 is grade 1 obesity; a BMI of 35-40 is grade 2 obesity; and a BMI > 40 is grade 3 obesity (also called morbidly obese). It used to be that morbid obesity sufficed as the term for people who were really, really obese. However, because so many people have moved into the morbid obesity range, a new class of obesity had to be added, the super obese, who have a BMI > 50. But if you drill down, there are some interesting findings. For example, Americans in the age range of yours truly, between 40-59 years old, are the most obese people in the U.S. Also, obesity is not a equal opportunity condition: African Americans are more obese than other racial groups. How does the U.S. stack up compared to other countries? The best information comes from the “Organisation for Economic Cooperation and Development” or OECD. The OECD 2015 health data indicates that the United States is the most overweight of all countries on the planet. 70% of Americans have a BMI in either the overweight category or the obese category. 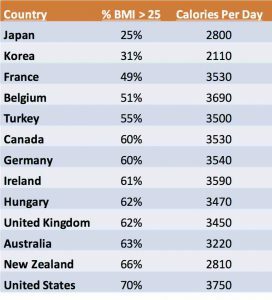 I’ve just selected a few countries in this table but even when you look at all OECD countries, the United States has the highest percentage of its population being overweight. 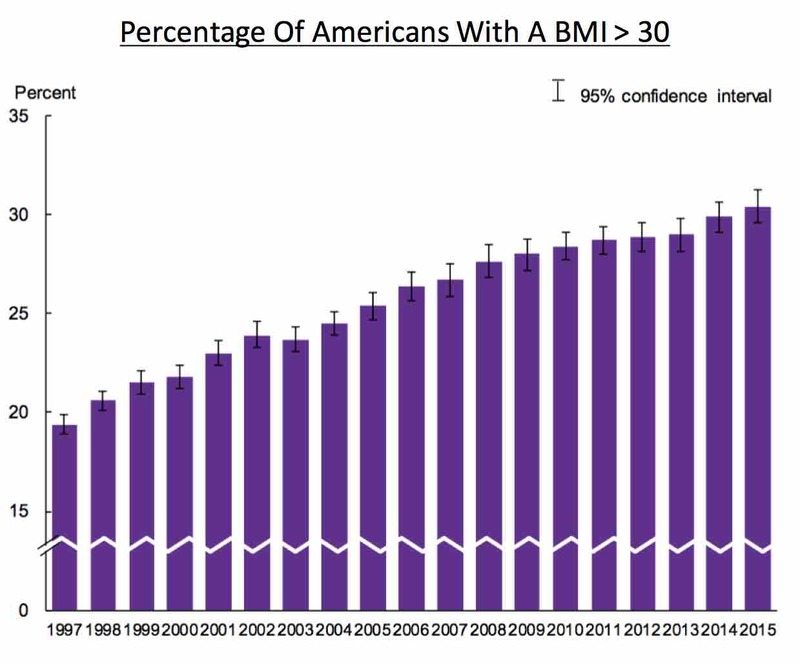 The other way of looking at this is that less than a third of Americans have a normal BMI. This is not something that we should be particularly proud of. One of the reasons that we are so overweight is that we take in too many calories. Here again, Americans lead the world. We consume an average of 3,750 calories per day. The only country whose citizens eat more than the United States is Austria at 3,800; however only 40% of Austrians report being either overweight or obese, presumably because they are more physically active than Americans. The recommended caloric intake for a middle-aged, moderately active adult is 2,000 per day for women and 2,600 per day for men (drop that number by 200 calories if that middle-aged person is sedentary). So we eat too much. Another way of looking at this is that Americans need to drop about 1,500 calories per day. Obesity is due to the confluence of two variables: calories in and calories out. If you want to become obese, you either have to have too many calories going in or you have to have too few calories being burned up. We are taking too many calories in, so what about calories being burned up? Not surprisingly, we don’t exercise enough. 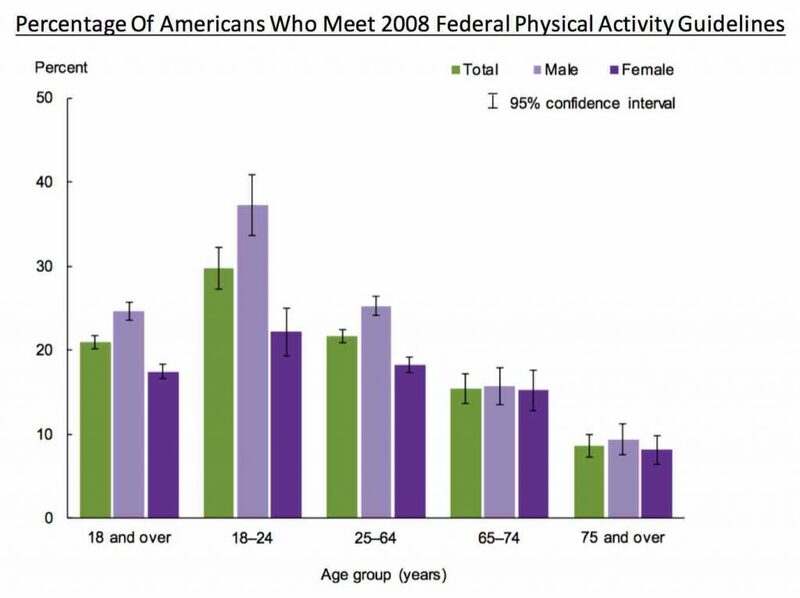 Although the percentage of Americans who do meet the 2008 Federal guidelines for aerobic and muscle-strengthening exercises during leisure time has been slowly increasing over the past 20 years, only 21% of Americans got enough exercise in 2015 according to the 2015 National Health Interview Survey. This is especially true for older Americans: the older we get, the less we exercise. Some people argue that we have placed too much emphasis on obesity and physical exercise. I disagree. Obesity is at the root of so many medical problems that result in healthcare costs, disability, and death: sleep apnea, hypertension, hypercholesterolemia, arthritis, heart disease, stroke, breast cancer, colon cancer, and diabetes. In fact, the prevalence of diabetes over the past 20 years tracks almost perfectly with the prevalence of obesity. Along with diabetes comes foot ulcers, leg amputations, coronary disease, stroke, peripheral neuropathy, renal failure, retinopathy, not to mention the cost of medications like insulin. If you add up all of the bad things that happen when you are obese, the result is that the higher the BMI, the more likely a person is to die. In a study from BMJ (the British Medical Journal) this year, researchers from the United Kingdom reviewed the world’s published literature on the relation of obesity and death and confirmed what has been generally accepted for many years. If a person is excessively underweight or overweight, their risk of dying goes up. The graph to the right is for all persons but when the researchers broke down the results into smokers and non-smokers as well as persons followed for 5, 10, 15, 20, or 25 years, the curves look the same. The best BMI to have is 22-24. If your BMI is less than 22 (underweight), your risk of death starts to go up. Similarly, if your BMI is above 24 (overweight), your risk of death starts to go up. And if you are morbidly obese, then you are 3 times more likely to die in 25 years compared to a normal weight person. So what can we as physicians do? First, we need to educate our patients about where their calories are coming from. That half-liter bottle of soda has about 200 calories. A Snickers bar, 215 calories. The large fries at your local fast food restaurant, 500 calories. And if you top those fries off with a medium milk shake, add 670 calories. Then if you finish off your day by splitting a medium pepperoni pizza with someone, that half of a 12-inch pizza cost you 900 calories. Total calorie cost = 2,485. If that same person instead had a diet soda, a couple of fun-sized Snickers bars, small fries, skipped the milk shake, and split a small pepperoni pizza, they would have cut 1,500 calories off of their day. 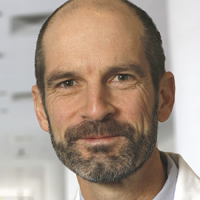 The other thing that we as physicians can do is to promote aerobic exercise in our patients. It doesn’t really matter whether that is running, swimming, treadmill, elliptical machine, or stationary bike. The best exercise is the one that the person will actually do. You can figure about 300-400 calories burned with 30 minutes doing any of these. Even regular walking for a half-hour burns up about 150 calories. The irony is that obesity is what keeps me in business. Overweight and obese patient need to see the physician more often, they get sick and use our hospital more often and all of that translates into more medical bills that we get to submit to insurance companies and Medicare. But we as a society can no longer afford obesity. If we really want to keep health care costs down, the best way to do it is to keep our BMI down.